Before I begin this historical article, I'd like to inform you, dear readers, that most of the information used was taught to me in X-ray school. I do have a degree in radiography and have been working in the field for five years. Though I have dressed up some of the information to demonstrate to you that the historical figures that are the focus of my article were real human beings with desires, hopes and suffering, I do not wish you to think that I have wedged in artistic lies to amp up the story's drama. Every event I've recorded below is a documented historical fact. "Don't talk to me about X-rays. I am afraid of them." Life is not easy. And sometimes the things we love the most and make us the happiest become our undoing. No one knew this more than Clarence Dally. He’d been a young man with bright dreams when he returned from the Navy. Those dreams dimmed when he spent a year toiling as a glassblower. Dally was one of the curious, a lover of science and technology. Luck seemed to turn for the better when he signed on as a mucker at the West Orange Laboratory. He’d be assisting Thomas Edison on incandescent lamps. It was a decision that would end in his early death. While still fresh in his work with Edison, news from Germany sent a sensation around the world. A physicist found a way to image the bones in his wife’s hand like a photograph. This new scientific magic known as X-rays was fascinating to any scientist or inventor. Edison and Dally could see the possibilities opening up before them. There were so many ways to alter the radiation output, using stronger and weaker tubes. It was amazing, new and fun. Dally spent hours with his left hand in direct exposure to radiation between a fluoroscope and an X-ray tube. Years went by and the excitement of this discovery never diminished. Possibilities opened up for the entire world. Surgeries could be assisted with higher survival rates, bullets and other foreign bodies could be easily located. But first, the science behind it all had to be perfected. 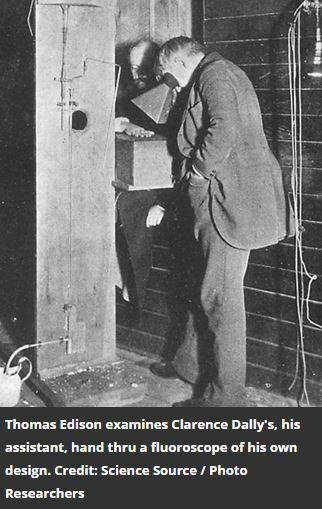 Edison and Dally had to learn how to control X-rays, and that meant long hours of testing and recording. There were plenty of 90-hour work weeks with Dally as the main test subject, which may have accounted for his exhaustion. He chose not to slow down; he was working to help save thousands, millions of lives, after all. He was nearing middle-age and hadn’t lived a terribly easy life, which may have explained his hair falling out. But the strange marks on his hand, and the blisters and sores that began to form were not as easily explained away. However, science could not rest for a painful hand. Dally simply switched which hand he used when experimenting and continued on. He slept with his swollen, red hands soaking in water. Eventually, the festering wounds required skin grafts. Perhaps he was not keen on the idea of letting down the famous Thomas Edison. Perhaps he had too much pride as a mucker to give up the work. But maybe it was his love for science, for the advancement of mankind and the obvious medical benefit X-rays could provide. Whatever the reason, Dally pressed on, far past the point of no return. The lesions on his hands travelled up his arm and onto his face. It was plain to all who could see that it was metastatic carcinoma. Dally had his left arm amputated just below the shoulder. Then his right hand underwent an amputation of four fingers. Pain. Immeasurable pain. All in the name of science. But the work had to stop. Dally had given nearly everything for his work, and it was time to retire. Edison continued to pay him while he rested at home with his wife and children. Though his work with X-rays had been ended for two years, the cancer had already taken hold. He had his remaining arm amputated. Less than a year later, at the age of 39, he died of cancer caused by radiation exposure. Body and life, Dally had sacrificed it all for knowledge. Ten years later, the entire world was in war. The Great War, World War I, began to rage. Throughout Europe, bodies of soldiers were piling up. Combat medics struggled to save their fallen heroes, only to fail against unseen traumas. Marie Curie was well aware of this problem at the very start of the war, being the quick-witted woman that she was. She would never confess to being a genius, though at the start of the war she was a Nobel Prize-winning scientist. She was nothing if not humble, and until her dying day she remained unaffected by riches or fame. All she really wanted out of life was a chance to serve mankind. And a bigger lab would be nice. When soldiers began to fall at the front lines, Curie quickly thought up an idea to save them. Her idea involved tutoring herself in the new discipline of radiology. She also taught herself anatomy and automotive mechanics. All that knowledge filling up Curie's brain produced a beacon of hope for the wounded soldiers; portable X-ray vehicles. The battlefront changed dramatically in the first year of WWI as Curie built 20 X-ray vehicles and 200 radiological units for field hospitals. It was only then she felt comfortable enough to train others to assist her. Now soldiers had a fighting chance at life when injured in battle. Curie exposed herself to dangerous doses of radiation in order to save wounded soldiers, but she would not allow herself to worry over such a thing. In the face of suffering, she could never have withheld her help. And when the war ended, her work still carried on. Ultimately, she passed away in 1934 of aplastic anemia, likely from her work with radiation. It was no surprise, from her years of unshielded X-ray exposure in the war, and being known to carry around test tubes of radioactive isotopes in her pocket. When she died, she had already been given the honor of being the first woman to ever win a Nobel Prize, and still to this day is the only person to win a Nobel Prize in two different sciences. This brilliant woman died at the age of 66, exchanging years for the service of mankind. Though the early deaths of Clarence Dally and Marie Curie were unnecessary and tragic, they did not die for nothing. Clarence Dally helped the world to realize the negative effects of radiation exposure, and Marie Curie gave the world courage to use radiation when needed. Today, there are still negative effects from using radiation in medical imaging, but the advancements in which our historical pioneers have led us have saved millions of lives, and it is important to remember our heroes of history.